ASUS laptops users quite often facing a problem when the computer is loading and the following error message appears: Secure Boot Violation. Invalid signature detected. Check Secure Boot Policy in Setup. According to the text of the message, the operating system can’t be loaded because of the detection of an invalid signature by the security policy. This laptop error can be fixed without contacting the service center, and in this article we will consider how to do this. If you enable the Digital Signature Driver Verification. In this post we’ll show you some simple ways to fix the problem and restore the system boot to a normal state. If the error occurs after connecting a second disk or a USB flash drive (which you are not going to use for the OS boot), make sure that you are booting from the correct drive (from the hard disk or Windows Boot Manager) or disconnect the attached drive—perhaps this will fix the problem. The next step is to check the Secure Boot settings in BIOS or UEFI (you can access this screen with the system settings is either immediately after clicking OK in the error message or by standard BIOS input methods, by pressing F1, F2, Fn + F2 or Delete). In most cases, you just need to disable Secure Boot (or Security Boot Control) by changing its state to Disabled. In most ASUS laptops, this option is located in the Security, Authentication or Boot tab. 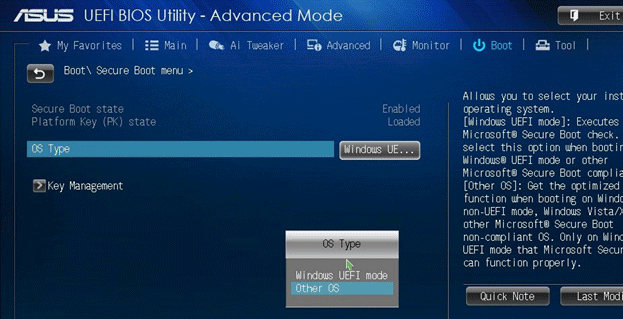 If there is an OS type selection entry in UEFI, then try to choose Other OS (even if you have Windows). If Enable CSM (or Launch CSM) option is available, change it to Enabled. After the changes made to the BIOS, they need to be saved. Usually the settings are saved with the F10 key, but again, it depends on the BIOS version. After that, the system should boot. Next step is when the user will need to find and remove the problem driver, then enable driver signature verification (security of the computer will be under serious threat without this). In some case an Invalid signature detected error appears after the UEFI/BIOS update performed. In this case, the bootloader can detect a mismatch between saved keys and the operating system. To reset the keys, in the Key management menu delete all protection keys and create them again (or leave “not installed”). How to Fix iTunes Error 54?